FUEL UP your employee incentive, fundraising, or loyalty rewards programs with Speedway gift cards. Speedway gift cards can be used at all locations for gasoline, food and eligible convenience store items. Your gift card recipients can also enjoy taking part in Speedway’s Speedy Rewards online loyalty program, where points are earned for purchases at the Speedy Rewards mall for free gas or merchandise. Speedway is the fourth largest chain of gasoline and convenience stores in the United States operating 2,750 locations in 22 states. They are the highest ranked gasoline brand in America! 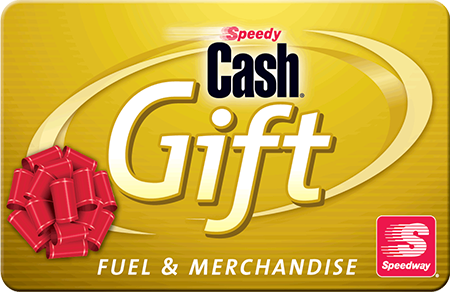 Speedy Cash Prepaid Gift Cards are redeemable for fuel and merchandise and can be reloaded at any Speedway location. How far are you from a Speedway? Find out. Use Speedway gift cards for any kind of program! Why choose Speedway gift cards? Yes, the minimum order is $500. $10, $20, $25, $50, and $100. Non-denominated gift cards are also available and can be loaded from $10-$1,000. Orders are shipped via USPS Priority Mail within 5-7 business days of payment receipt. Speedway gift cards are shipped in bulk to a single location. The value is printed on the pre-denominated gift cards. No, Speedway gift cards have no expiration dates. No, Speedway gift cards have no dormancy fees or other fees. No, Speedway gift cards can be redeemed for merchandise and fuel only. Unless required by law. Speedway gift cards can be used to purchase merchandise and fuel at over 2,750 Speedway locations in 22 states. Find a Speedway near you here. Speedway gift cards are treated as cash. We are not responsible for lost or stolen cards.